Search and rescue practice was on the agenda today as I headed up to the Pass for a day of Patrolling. 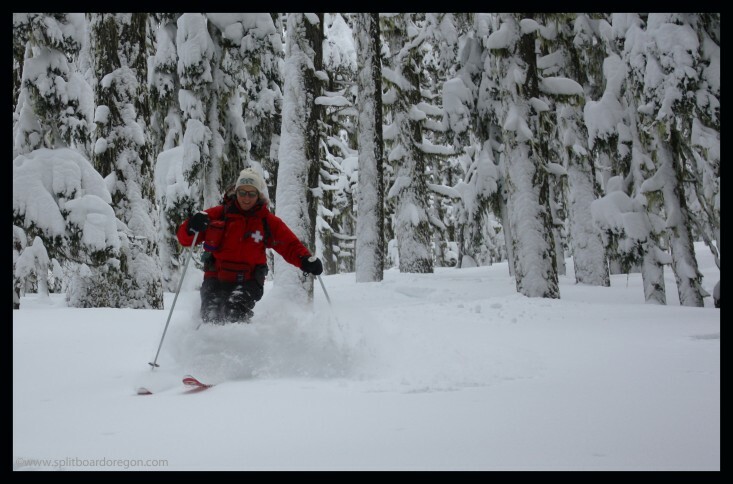 This activity is fun because it affords the opportunity to head out of bounds with the splitboard to practice GPS and compass skills, with the added bonus of getting untracked turns outside the area. 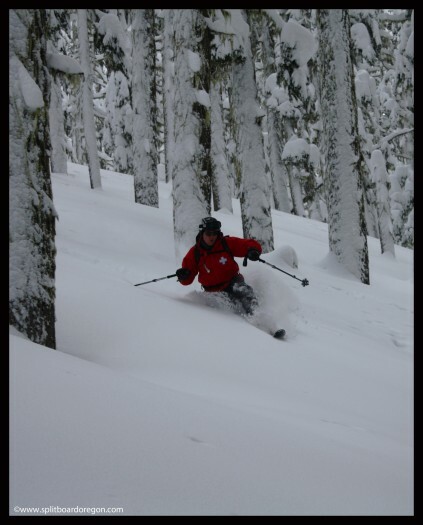 The reason for the practice is that generally a few times every year people become lost or stranded outside the area, requiring help from Patrol and sometimes Lane Co Search & Rescue. After opening the mountain in the morning, I met up with Laurie and Todd in the patrol base area for a quick breakfast and to study a map of the area. Laurie gave us some coordinates of a “lost” party, and finding them would be our objective for the morning. The area they were lost in just happened to be in one of the better areas for riding back to the resort – the high point on Cherokee Ridge. After putting the coordinates in our GPS’s, we loaded the EPA lift with our overnight packs and rode down to Boundary Pass, where we switched to skinning. We set a track around the ridge, following our compass bearings and occasionally looking at the GPS. Within about 30 minutes, we located the lost party (several pieces of pink surveyor’s tape), heated some water with our Jet Boil stoves and talked over how to warm a cold patient and other possible scenarios. After running through another mock scenario, we skinned to the top of Cherokee Ridge and dropped in to some excellent fresh powder. There is actually more vertical from the top of Cherokee back to the ski area than you think, and we made turn after turn through the gladed trees in the untracked powder. It’s always nice to earn turns and make tracks, but today was nice because it was a patrol day and the snow was great.